Multi-colored galaxy cake roll with black chocolate ganache, topped with sprinkles! We’re adding our own out of this GALAXY recipe to the mix! Have you seen the galaxy recipes that are popping up on the internet? I heard that galaxy food is the new rainbow food. 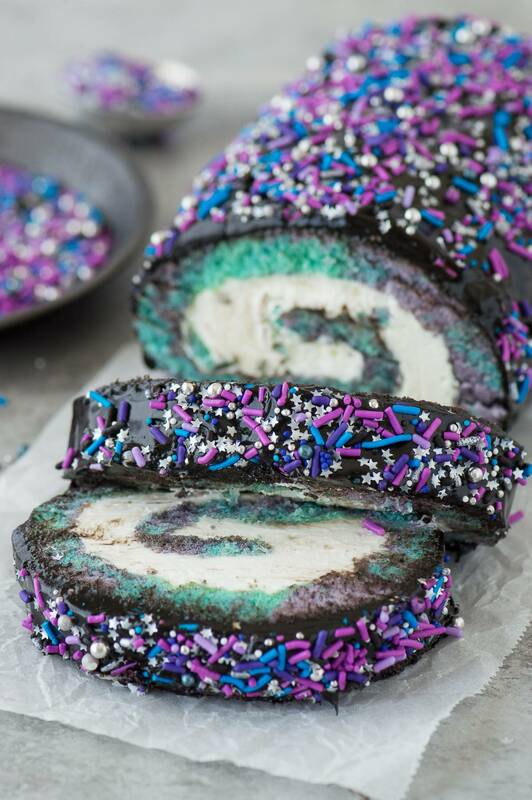 I suppose you could enjoy a rainbow smoothie or popsicle while eating a slice of this galaxy cake roll then! This recipe involved a lot of firsts for me. It’s the first cake roll I’ve made – ever! It’s the first time I made black chocolate ganache! And it’s the first time I used Sweetapolita sprinkles! Which I am now a BIG fan of! 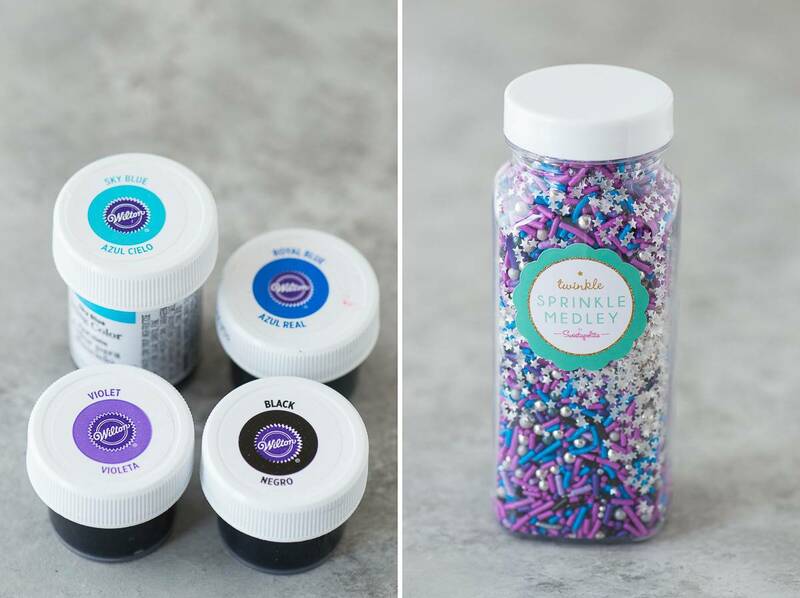 Rosie is a food blogger with a passion for sprinkle mixes so she started her own sprinkle shop. 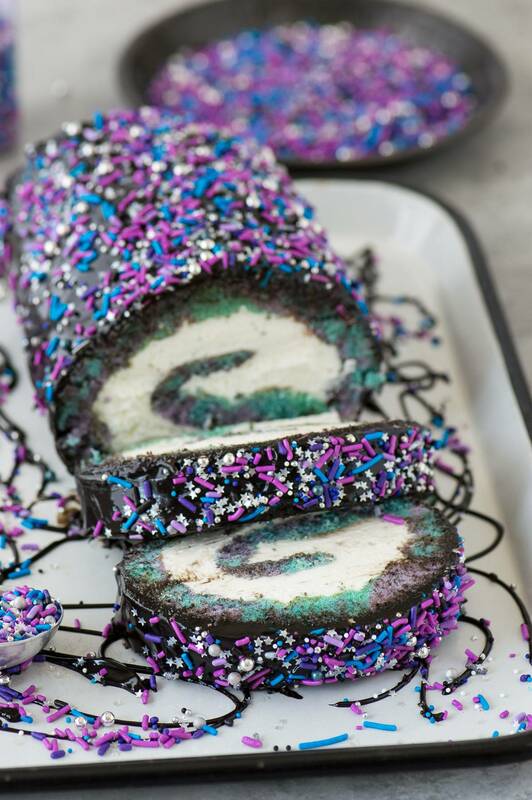 I knew her twinkle sprinkle medley mix would be perfect for this galaxy cake roll! I also included a picture of the gel food coloring I used. 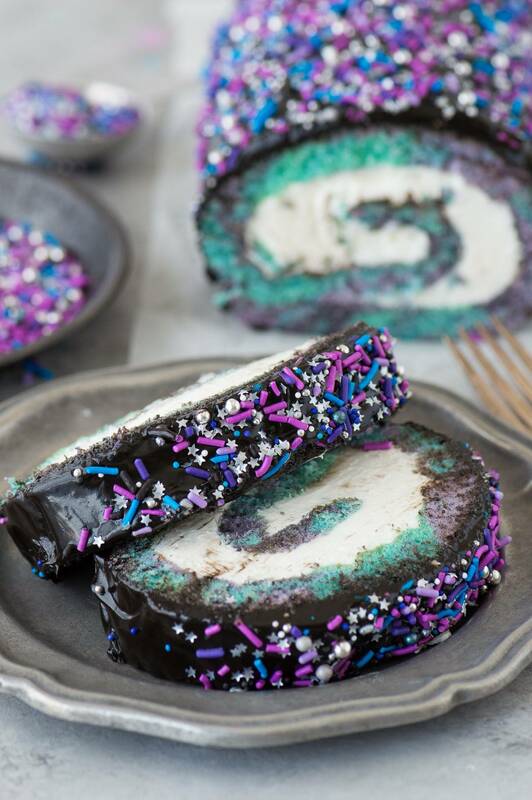 I was sharing with some friends that I made a galaxy cake roll and some of them didn’t know about the galaxy food trend, so I tried my best to explain it! 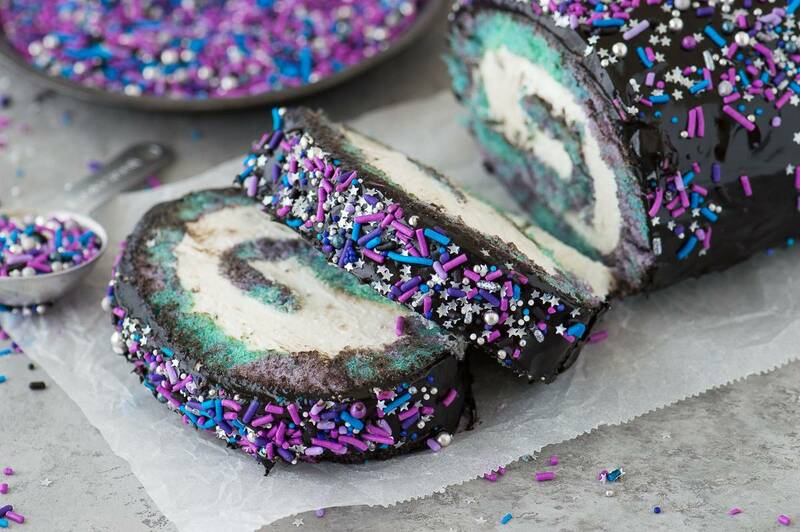 Galaxy food is all about taking a regular recipe and infusing it with galaxy colors – think purples, teals, blues, blacks, sparkles and glitter! I’ve been putting off making a cake roll because I thought it would be complicated and that my roll would end up cracking – but it’s actually quite easy! I’ve included a lot of step by step photos to illustrate the process of making a cake roll. 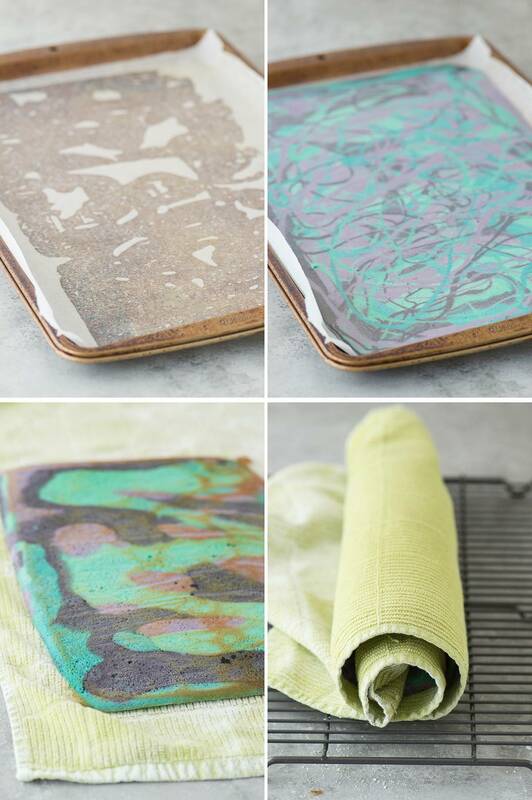 Line a jelly roll pan (15×10) with parchment paper and spray with cooking spray. 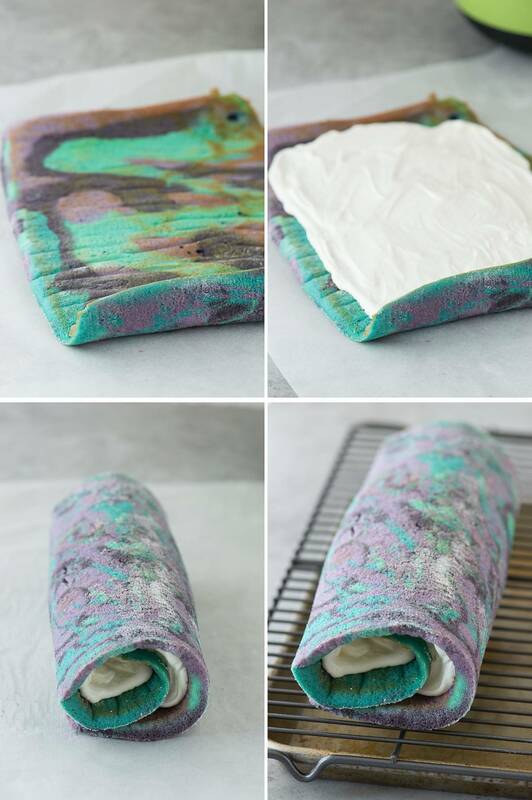 After the batter is made and dyed, drizzle the various colors into the pan, rotating through the colors.Bake for 12-13 minutes, then immediately turn the cake roll onto a towel that is sprinkled with powdered sugar. 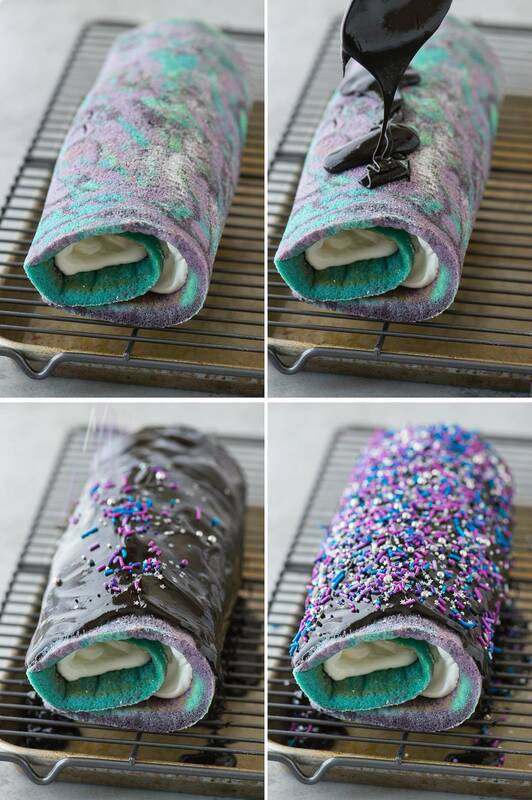 Roll the cake around the towel and place it on a rack to cool completely. Once the cake is cooled, unroll the towel. Spread the filling over the cake roll, leaving about a 1/2 inch gap around the edges. Roll the cake roll back up and place it on a tray, seam side down, in the fridge to chill. The longer you let it chill the easier it will be to slice. To add the ganache, place the cake roll on a rack, pour the ganache over the cake and use a spoon or spatula to cover up any areas that don’t have chocolate. Begin to add the sprinkles. Return to the fridge to chill for 20 minutes before slicing. I was a little apprehensive that I wouldn’t be able to make black chocolate ganache – but it worked! I added black gel food coloring to the boiling heavy cream, mixed that together and then poured it over the chocolate chips – I can see this coming in handy for Halloween! Preheat the oven to 350ºF. Line a jelly roll pan (15x10) with parchment paper and spray the paper with non-stick cooking spray. Set aside. 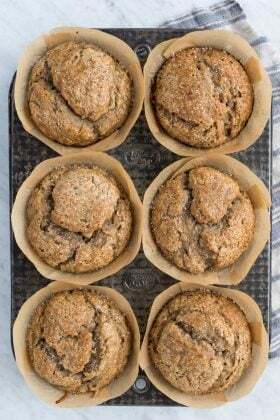 In a small mixing bowl, combine the flour, baking powder and salt. Mix and set aside. 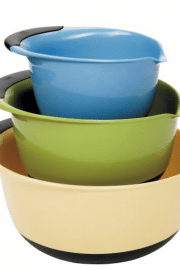 In a larger mixing bowl, beat all 4 eggs on high with an electric mixer for 3 minutes. The eggs will turn pale yellow. Continuing beating the mixture as you slowly add the sugar. Add in the vegetable oil, buttermilk, apple cider vinegar, and vanilla, beat lightly. Spoon in the flour mixture, mixing until it’s just incorporated. Divide the batter among 4 bowls. Add a small amount of gel food coloring to each bowl, mixing with a spoon until the color is even. The colors we used were purple, blue, teal and black. 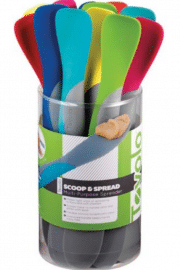 Rotating through the colors, drizzle the batter into the pan, making swirls. Bake for 12-13 minutes or until the cake is springy to the touch. Note: while baking lay a towel on a flat surface. Dust the towel with a generous amount of powered sugar. This is to prevent the cake from sticking to the towel. Once the cake is done baking, immediately turn it over onto the towel. Roll the cake around the towel. Place the rolled up cake on a rack to cool completely. 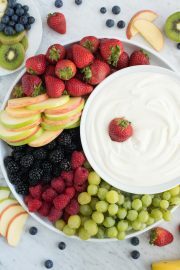 In a medium mixing bowl, beat the cream cheese and powdered sugar until fluffy with an electric mixer, 1-2 minutes. Add in the cool whip and mix gently with a spatula. Once the cake is completely cool, unroll the towel. Spread the filling over the cake roll, leaving about a 1/2 inch gap around the edges. Roll the cake roll back up and place it on a tray, seam side down, in the fridge to chill. The longer you let it chill the easier it will be to slice. 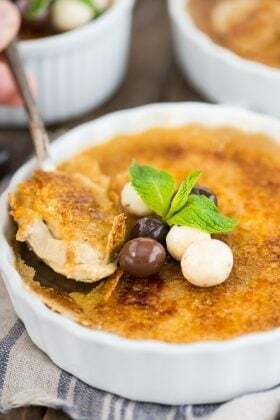 Place chocolate chips in a medium heat-proof bowl. In a small pot over low heat, heat the heavy whipping cream until just before boiling. 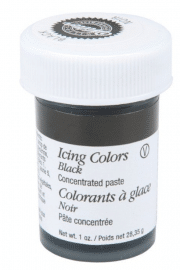 Add in a small amount of black gel food coloring, mixing with a spatula. 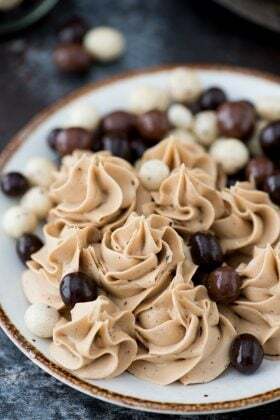 Pour the heavy cream over the chocolate chips. Allow the mixture to stand for 1-2 minutes. Use a spatula to stir the mixture until smooth. Allow the ganache to come to room temperature before adding it to the cake. To add the ganache, place the cake roll on a rack, pour the ganache over the cake and use a spoon or spatula to cover up any areas that don’t have chocolate. Add the sprinkles. Return to the fridge to chill for 20 minutes before slicing. Slice and serve. Cover and refrigerate any leftovers. Adapted from Garnish and Glaze. It’s way easier than I was expecting! I love this so much!!! I just had to come over and let you know! 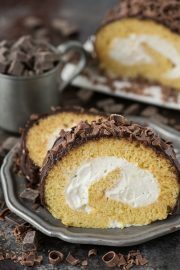 <3 I've been making roll cakes for years and they are one of my favorite desserts to make!! Yours is AMAZING! Thank you Angie!! I am so glad I stepped out of my comfort zone and made one! I tried to make a cake roll for Christmas once and I think it had about 15 different cracks in it! I’ve been scared off ever since but I think it’s time to face my fears. This is so fun!! My daughter will be making this soon I am sure, it’s gorgeous! She always wanted to make a roll cake, this would be the one to start off with! I hope she has fun making it! This is so awesome!! 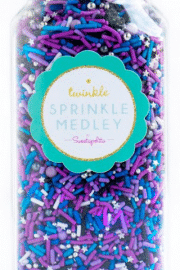 The cake is beautiful and so are the sprinkles! Thank you Holly! I love Rosie’s sprinkles! First I have heard of Galaxy cakes, but it is pretty. Cake rolls are easy and also easy to serve. Thanks for this great looking recipe. 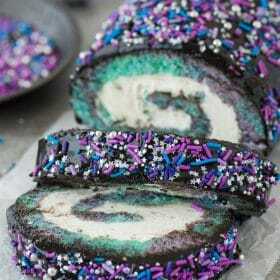 Double fun here with galaxy theme and a cake roll! It sounds like it turned out so pretty!